clans and tends coat, mane and tail. 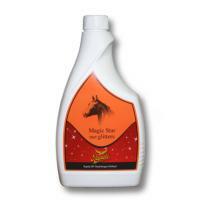 Repulse filth and makes your horse shine. Leaves mane and tail tangle free and luxuriously soft with a brilliant shine. shake before use. Spray it equable on mane and tail, let it dry, brush main and tail with a soft brush do not use this product where the saddle is fastened. Does not contain any harmful substance. Reserve frost-proof.